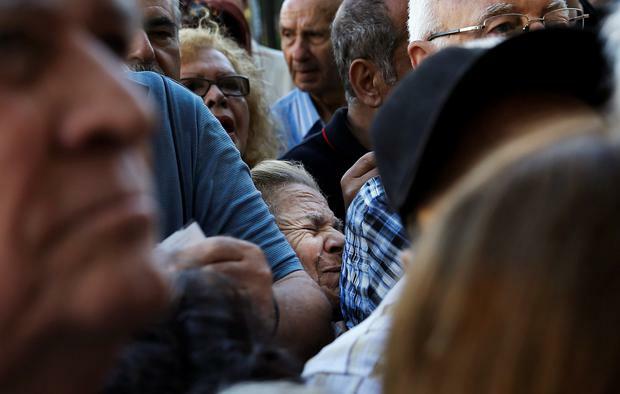 As Greek Prime Minister Alexis Tsipras vowed to move ahead with the referendum, hundreds of Greek pensioners took to the streets of Athens demanding the Government release their money after a limit of €120 was put on their state pension. Elderly pensioners queued throughout the day for the €120 which must last them for a week, causing frustration to turn to anger. Several hundred joined a protest group in central Athens marching through the streets to the Central Bank. The group shouted chants, urging people to take to the streets and rise up. 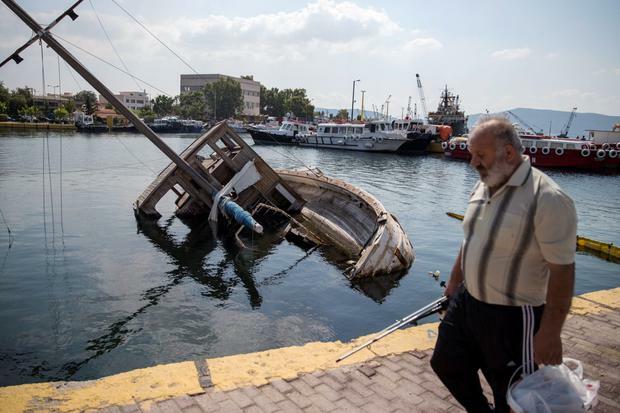 They demanded the Government give them their money back and insisted the Greek leadership would not buy them off with a 'tip' or charity of €120 a week. The state pension can vary depending on a person's work history, however not all state pensions are subject to the €120 weekly limit. Among the crowd was George Lagaras (58), a retired seaman who has been supporting his wife and two children on his usual €1,000 a month pension. "I have worked all my life and now the Government thinks I can live on just €120 a week. We can't cover any of our bills with this but I am not worried about the bills. I am worried about food and health. "I provide for my wife and two children. We cannot survive on this," he said. 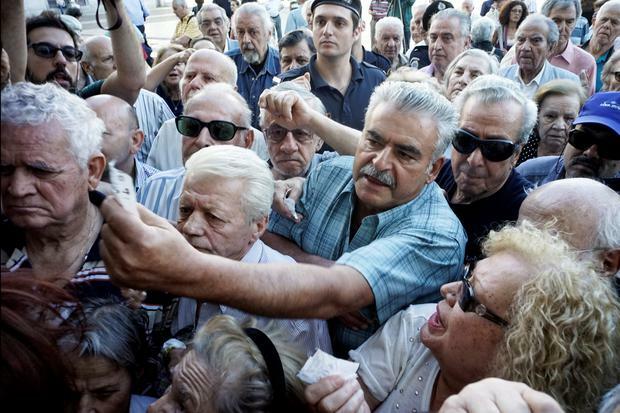 At some banks, pensioners had gathered from midnight on Tuesday to receive their money. For some older people the heat and chaos was too much, with reports of several pensioners collapsing. 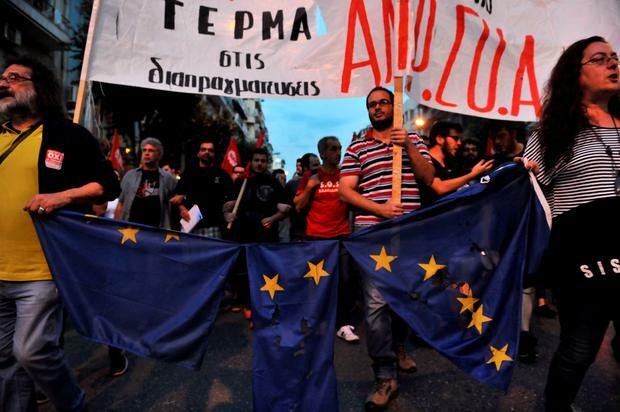 Others expressed their anger at the Greek government. Sophia Lagiou (65), a retired police officer, demanded the Syriza party return to the negotiations. She said she and her husband could not survive on the meagre €120 a week. "In Greece was born democracy for Europe and we hope for the best. But I worry and I am afraid. Our government has lost common sense," she added. Aohna Namttpotkh (60) must look after a household of three people on the €120 payment. Greek Prime Minister Alexis Tsipras addresses the nation in this handout photo released by the Greek Prime Minister's office in Athens, Greece July 1, 2015. A defiant Tsipras urged Greeks on Wednesday to reject an international bailout deal, wrecking any prospect of repairing broken relations with EU partners before a referendum on Sunday that may decide Greece's future in Europe. REUTERS/Andrea Bonetti/Greek Prime Minister's Office/Handout via Reuters ATTENTION EDITORS - THIS PICTURE WAS PROVIDED BY A THIRD PARTY. REUTERS IS UNABLE TO INDEPENDENTLY VERIFY THE AUTHENTICITY, CONTENT, LOCATION OR DATE OF THIS IMAGE. FOR EDITORIAL USE ONLY. NOT FOR SALE FOR MARKETING OR ADVERTISING CAMPAIGNS. THIS PICTURE IS DISTRIBUTED EXACTLY AS RECEIVED BY REUTERS, AS A SERVICE TO CLIENTS. NO SALES. NO ARCHIVES. "They are unemployed. This is the only money we have. It is only just covering us for what we vitally need," she said. As the day progressed, the queues to enter the bank diminished slightly, but not so for those attempting to use ATM machines, where people stood in line well into the evening. A number of those making their daily pilgrimage for €60 expressed their concerns about a rise in crime as the uncertainty and cash shortages continued. Mother-of-two Ereftheria (34) said she was worried about keeping money in her home, as robberies were increasing. "I have a two-year-old and a two-month-old baby. It is really tough. I managed over the last week to get some money out but it is dangerous to keep it at home. I don't want to have such money at home, there have been more robberies... but I must have something in case I need it for my children. Even going to an ATM in the wrong area is dangerous. There are a lot of police at the machines which is good, but it still scary," she said. Outside the Finance Ministry in the capital, a banner reading "No to blackmail and austerity" was unfurled at midday. The finance minister insisted he had nothing to do with the banner, which was the initiative of trade unionists. 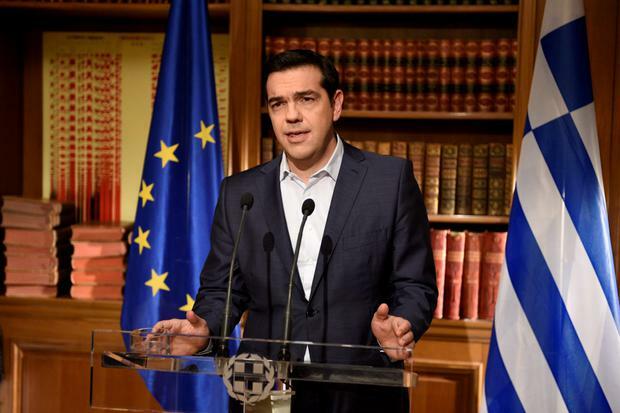 While hopes briefly blossomed that Syriza would cancel the planned referendum and return to talks, that was quickly quelled in a televised message from Greek leader Alexis Tspiras shortly after 5pm. Greeks' reaction to the news that the referendum would go ahead was mixed. While a significant number of younger voters welcomed the decision, for older citizens the news was a blow. Tourist businesses in the city were also suffering. 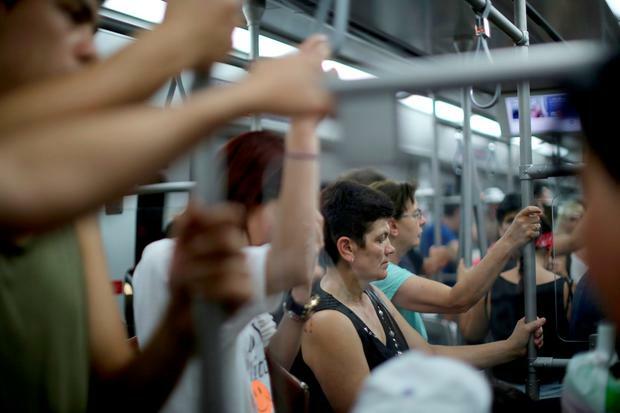 Yanis Tziovaras works for the sightseeing company, Athens Happy Train. He explained how the numbers using the usually busy service had dropped off dramatically. "We should have three trains running full at this time. But our first train had eight people and this one is empty. The tourists don't know what to do and the locals have no money because the banks are closed. We would usually have many parents on days off bring their children on tours but this week it has fallen off." Mr Tziovaras said many Greek people believe there will not be a referendum. "People don't know what is going to happen next week, next year, in the next hour. I don't think there will be a vote, no one knows if we are meant to say Yes or No, we don't know what we are being asked. I think about 70pc to 75pc would vote Yes," he added. He said the majority of people accepted the current system had to change but some remained entrenched. "Many people can't understand it, but we have a system where a doctor makes maybe €1,500 but someone cleaning the streets or working in our offices makes the same or €2,000. It does not make sense that it is the same but we still have people who don't think about the fact that a doctor has to train for nine years," he added.